The chalet is situated in a lovely area of the north end of South Uist and is quiet and peaceful location and is ideal for a very relaxing holiday. 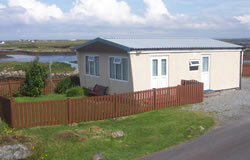 This is in an ideal location and has fantastic views over the South Ford and to the hills on South Uist. The chalet consists of a kitchen, sitting room, dining room, bathroom, two bedrooms and can sleep up to 6 people. Within a few miles on the neighbouring island there are other shops and attractions and also a Community School which houses a games hall, swimming pool, fitness suite, café and a well stocked library. You can enjoy lovely leisurely walks and cycling from the chalet. There is a small wooden shed beside chalet for use by visitors for storage, fishing gear, walking gear etc.